Hello everyone! 1984 publishing and Michael Gingold (former editor of Fangoria and current editor of Rue Morgue) were kind enough to send me a copy of Gingold’s latest work: “Ad Nauseam: Newsprint Nightmares from the 1980s". I’ve had the book for a couple of weeks and have had the distinct pleasure of working my way through it. In what follows, I’ll articulate my general thoughts on the book along with including some images featured therein. Holding my copy of “Ad Nauseam”. 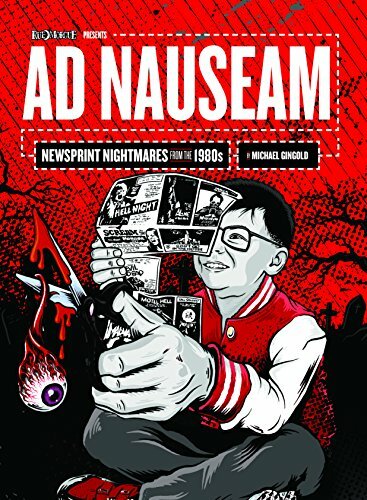 “Ad Nauseam: Newsprint Nightmares from the 1980s is a year-by-year deep dive into the Gingold archive, with more than 450 ads! Within these pages you'll see rare alternate art for Gremlins, Child's Play, The Blob remake, and the Friday the 13th and A Nightmare on Elm Street franchises. You'll also revel in oddities including Psycho from Texas, Dracula Blows His Cool, Blood Hook, Zombie Island Massacre, and many more. Upon opening the cover and taking several quick peeks at the content inside “Ad Nauseam,” I experienced an overly joyous sensation. The book immediately transplants the reader out of the digital age, placing them squarely in the madness that was the 1980s. Vintage ads and posters shoot off the page, ranging from the most popular films of the era (e.g. Poltergeist), to a plethora of obscure, hidden gems (e.g. Blood Hook, Julie Darling). The first and most obvious thing to note is the beauty with which these ads are organized and presented. The scans provide a fantastic representation of Gingold’s personal collection, most of them exhibiting a pristine quality. The ads are intuitively placed and the review excerpts and personal stories are wisely chosen and supplement the images well. Generally speaking, it’s a beautiful book and one that any fan of 80s horror would be proud to display at the front of their collection. 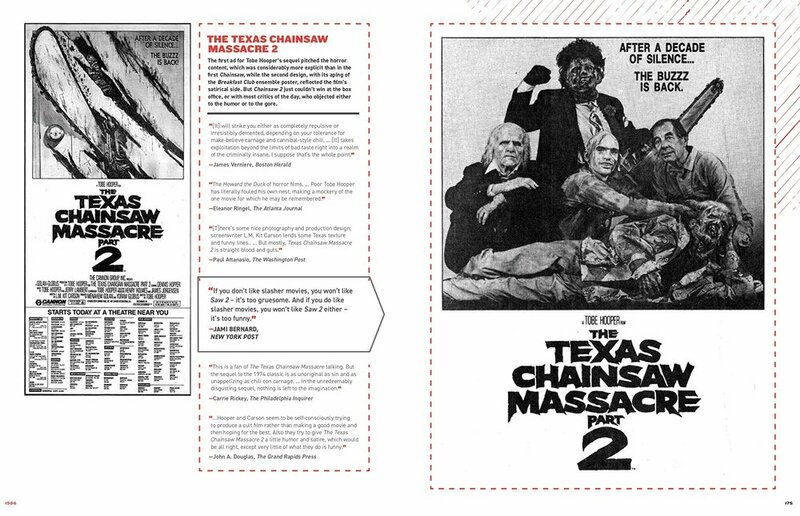 A nice example of the general layout of the book, featuring “The Texas Chainsaw Massacre Part 2”. The included review quotes are contextually fascinating and a great supplement to the images. In terms of the overall organization, the book is broken down by year: 1980-1989. Indeed, I was a bit taken aback at the similarities in content and structure with 80shorror.net. In many ways, the book serves as a great supplement to the site, following a similar chronology while thematically asserting itself as a sort of historical cousin. One could easily browse the site with “Ad Nauseam” closely in hand, immersing oneself both digitally and corporeally in a simultaneous 80s horror frenzy. The book works on several different levels. Firstly and most literally, it plays out as a sort of retro show and tell for Gingold. It works in a similar fashion whereby you might be hanging out at a friends place and, shortly thereafter, they start lugging out endless shoe boxes full of aged magazine clippings. There’s an omnipresent satisfaction and pride that the book’s content conveys - it’s clear that Gingold gains great pleasure in presenting the images to the reader, emphasized specifically by the occasionally included personal story on how he came across a particular ad as well as the experiences surrounding it. The book is first and foremost simply an illustrative love letter to 80s horror - an embracement of an era passed and the ways in which parts of our youth are carried with us, shaping countless aspects of our lives. The book also works as a straight-forward historical documentation of the horror genre and the ways in which it evolved over the course of a decade. We’re able to see the ways that ads begin changing over time and we’re also given a glimpse of general sub-genre trends, as certain types of films become more prevalent and others start to decrease over the span of ten years. Perhaps the most fascinating way the book works, however, is in its ability to contextualize the genre through the avoidance of anachronisms. One of the most difficult parts of obtaining a somewhat objective view of a heavily nostalgic and influential period like 80s horror is the tendency to filter our perceptions of it through either the contemporary cultural, social and technological developments following the decade and into the present day, or our own past subjective experiences with it, often resulting in a nostalgically saturated perspective. This, of course, prevents us from ever being able to establish a firm connection with the reality of the era. Obviously, this isn’t all bad - half of the fun of experiencing something like A Nightmare on Elm Street or any number of films from the era lies in the fact that we have certain nostalgic connections to it; however, from a philosophical perspective, I’ve always found it personally interesting to be able to escape the bounds of this bias while exposing myself to a view that more accurately captures the ontological status of the media in its purest form. The book manages to do this by directly providing unadulterated images cultivated during a certain point in time. Further, by including actual reviews and opinions of critics freshly exposed to the film, we’re also given insight into the general social fabric of the times. The results of this phenomenon often yields very shocking results, with films like “The Thing” contextually being dismissed (and at times in unabashed ways) by several critics, while other films are praised, despite clearly not aging well and never garnering any sort of following. If it isn’t already obvious, I thoroughly enjoyed “Ad Nauseum”. I found it to be stimulating on a historical, philosophical, and nostalgic level and certainly see myself taking it out from time to time, particularly to show friends who share my love for 80s horror. I think it would make a great addition to any horror fan’s collection - indeed, if you consider yourself to be a collector of posters or really physical media of any kind, I would go so far as to say that it’s almost an essential purchase. You can grab the book from Amazon using the link provided here, or alternatively you can head over to 1984 publishing here for a signed addition!